He succeeded King Taejong Muyeol, and unified the three kingdoms. He defeated the Tang forces, and laid a foundation for the prosperity of the unified Silla. Silla was ‘a millennium kingdom’ that achieved the cultural unification of the three kingdoms, Goguryeo, Baekje, and Silla. Gyeongju is a historic city that has preserved Silla’s culture, relics, and soul. It is a rare city that has 1000 years of history as a capital of a country. The entire city is like an ancient history museum of Korea. The entire city is registered as a UNESCO World Cultural Heritage with 5 main areas. Gyeongju fascinates its visitors with its rich cultural and historical assets. There is no comparison to this masterpiece in the East. ‘Granite’ Silla’s sculptors created this soft and exquisite artwork by finely cutting tough granite. 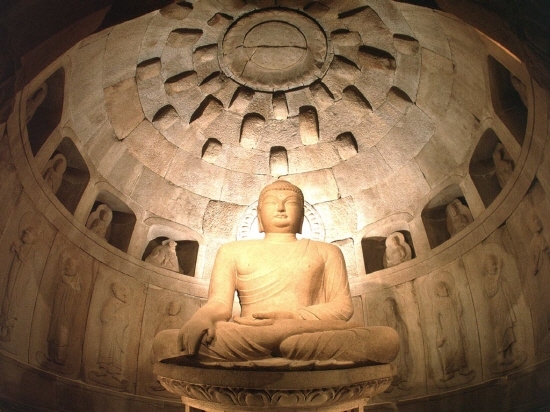 The Buddha statue in Seokguram has attracted high praise internationally. There is a round dot in the middle of his forehead. This dot was sculpted multi-dimensionally in order to reflect sunlight to the foreheads of the eleven-faced Avalokitesvara Bodhisattva, the Bodhisattva of Compassion, in the rear. Such design maximizes lighting effects in the grotto, which attests to Silla’s advanced technology. It reveals the height of Silla’s technology that even modern technology cannot reproduce. Seokguram is evidence of the level of Silla’s technology and the essence of its art. Bulguksa has preserved Korea’s rich Buddhist cultural heritage until today. 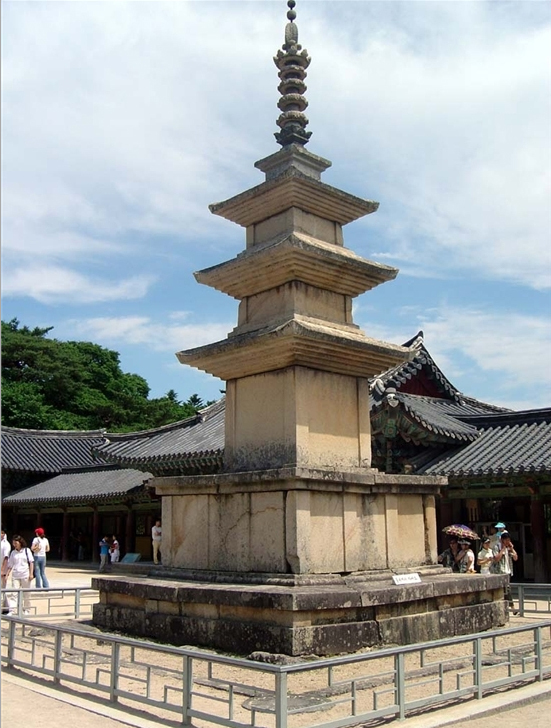 There are two pagodas that represent the Bulguksa Temple. The perfect symmetry and stability were the result of careful calculations. It was designed to create an ascending optical illusion. Individual stones were assembled perfectly with no use of adhesive. Exact symmetrical balance and exquisite decorations. Seokgatap and Dabotap pagodas are the products of the combination of Silla’s Buddhism, technology, and artistic soul. The world cultural heritage of Bulguksa hosts both of these two pagodas. Cheomseongdae presents a great harmony of straight lines and curves. It is composed of 362 stone pieces, representing the days of a lunar year, and a square-shaped upper stone that points to the directions of east, west, south and north. Cheomseongdae reflects the wisdom of the Silla people, who attempted to use the knowledge gained from observing astronomical changes. Silla’s advanced scientific knowledge was integrated into the construction of Cheomseongdae. The tombs contained invaluable artifacts that show life during Silla. Old tomb parks are like time capsules that bring visitors into the glorious Silla culture. The Silk Road started in Europe and ended here. Around 70% of the unearthed golden crowns in the world are concentrated in Korea. Korea is highly praised as a country of golden crowns. Among all of them, Silla’s golden crowns are the most exquisite. Beyond China, across Qansu, there is a country with many mountains and an abundant of gold, called Shilla. Muslims who happen to go there are fascinated by the good environment and tend to settle there for good and do not think of leaving the place. The reputation of Silla’s golden culture spread even to the Arab world. The result of the advanced golden culture was the golden crowns of Silla. Namsan Mountain was the realization of Buddha’s land that the Silla people had longed for. Namsan Mountain in Gyeongju is called the outdoor museum of Silla. Throughout Gyeongju, there remain many Buddha statues from Silla’s 1000 years of history. Mt. Namsan in Gyeongju witnessed everything throughout Silla history. According to a legend, the sound of this flute would resolve all the worries and concerns of the country and the people. The legend shows what the Silla people desired the most. This flute delivers the Silla people’s old wish to us. Can you hear this flute’s sound? 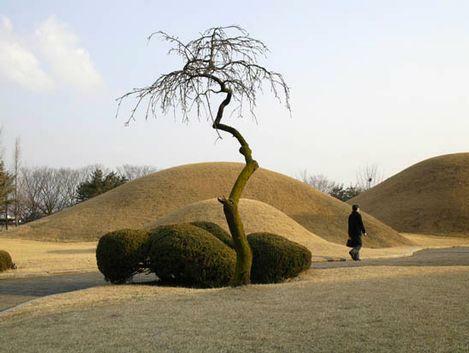 Gyeongju holds a collection of Silla’s history, science, culture and art. Gyeongju is a time-honored fascinating city with over 200 cultural assets. This city will take you to the glorious past of Silla. Are you interested in a trip to Gyeongju? VANK members are here for you. We will take you through the culture and history of Silla. In Gyeongju, you will hear the resonant sound of Manpasikjeok. It is the welcoming voice of Koreans.